With an upholstered seat and arms for additional support, these counter-height stools are a comfy choice. 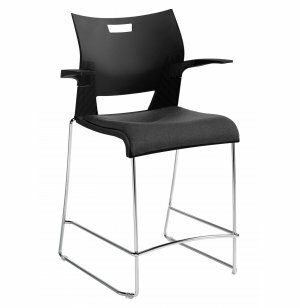 Upgrade your eating space or commons area with cool contemporary Duet Counter and Bar Stools. A combination of comfort, durability and visual appeal will give your students or employees a great place to sit during meals, study sessions and more. Low-maintenance polypropylene shells include a built-in carrying handle while steel rod frames offer sturdy support in a sleek chrome hue. Whether you choose counter-height stools or bar stools, the angular modern design will give your space a whole new look. A stylish sled base with non-marring glides protects your floors and keeps stools positioned where you want them. The waterfall seat edge and foot rail facilitate comfortable sitting. With so many great features, you can take your space to a whole new level. Global's stated mission is to manufacture world-class products at middle-line cost. That goal is realized with a wide range of beautiful office furniture including file cabinets, desks, conference tables, executive chairs and guest furniture. Counter Height: The 24"-high seat fits perfectly with counter-height surfaces. Comfortable: Fiberglass-reinforced nylon arms offer additional support. Stackable: Stack up to 3 high on the floor. Perfect Match: Coordinate upholstery selection with shell for a custom combination. Quick Cleaning: Polypropylene shells are easy to wipe down. Easy Transport: A built in carrying handle on the back makes these stools simple to move. Healthy Design: Waterfall seat fronts enable natural blood flow. 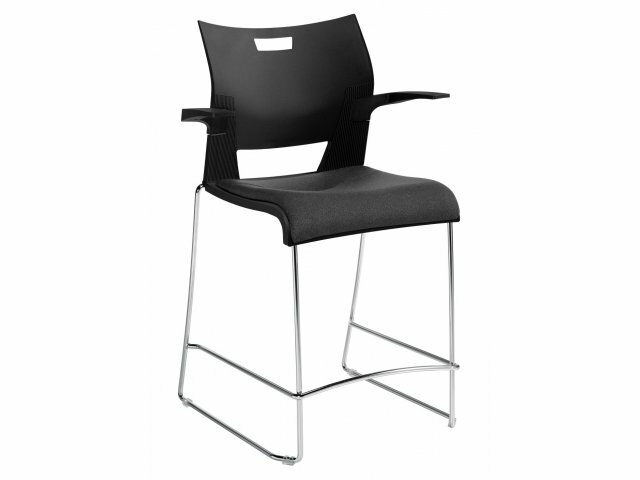 Sturdy Material: A steel rod frame makes these chairs both stable and strong. Enhanced Support: Foot rail provides extra comfort and stability. No Damage: Sled bases have non-marring glides which eliminate scratches and scuffs on floors. Attractive Hues: Available in a selection of shell colors. Hertz Furniture is proud to accept the “Outstanding Dealer Award” from Global Industries. Global acknowledges Hertz Furniture’s success in satisfying customers with a wide range of top-quality furniture. Ships 2 per carton; prices are per item.